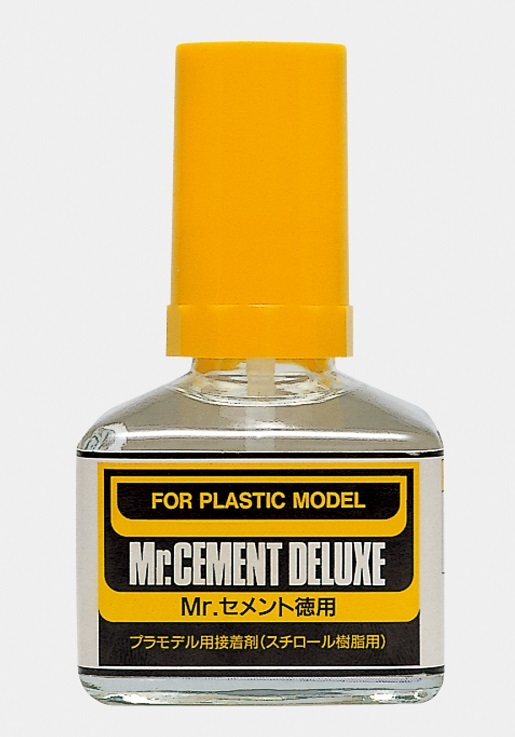 Mr.CEMENT is appropriate for attachment between plastic parts in models(sterol resin plastics). Mr.CEMENT has a suitable adhesion and strong strength because it contains high-quality resins. Contains a brush. . MR. CEMENT ES UN PEGAMENTO APROPIADO PARA UNIR PARTES PLASTICAS DE MODELOS Y PLASTICOS DERIVADOS DEL ESTEROL. SU ADHERENCIA ES FACIL Y FUERTE DEBIDA A SUS FINAS RESINAS DE ALTA CALIDAD. CONTIENE APLICADOR DE BROCHA. CONTENIDO 40 ml.